The Trixie Grass Rabbit Bed is made from 100% natural products. An edible snuggle bed. 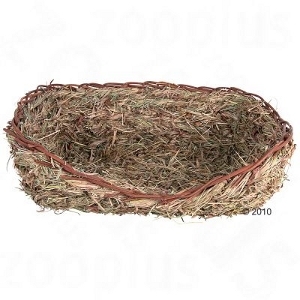 This grass nest is made from 100% hay and willow branches and is the perfect sleeping place for your pet bunny. The bed can also be eaten. The grass bed is woven from natural materials and does not contain wires or metal parts. One side is lower so that your pet rabbit can easily climb in. A comfortable resting place for rabbits, made from, edible naturally dried grass.